🙁 photo of BLS losing! 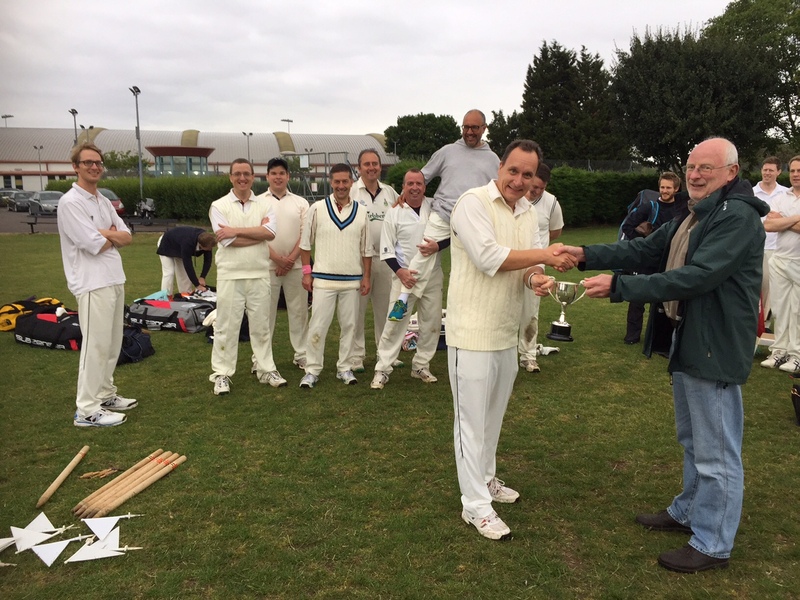 John Moriarty presents the Bar with the Trophy – Hat-trick! 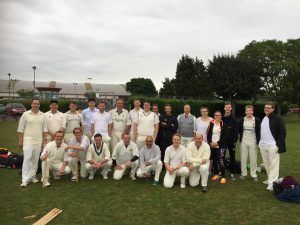 The Bristol Bar snatched victory from the jaws of defeat as the BLS were bowled out 2 runs short of a modest target in an astonishing 16: 16 cricket match. 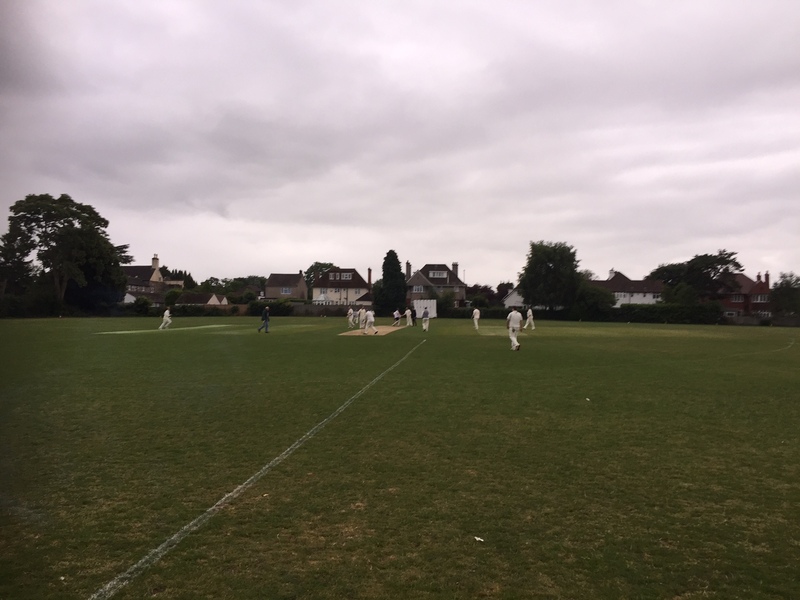 The Bar won the toss and elected to bat first hoping to gain an advantage in the gloomy conditions. 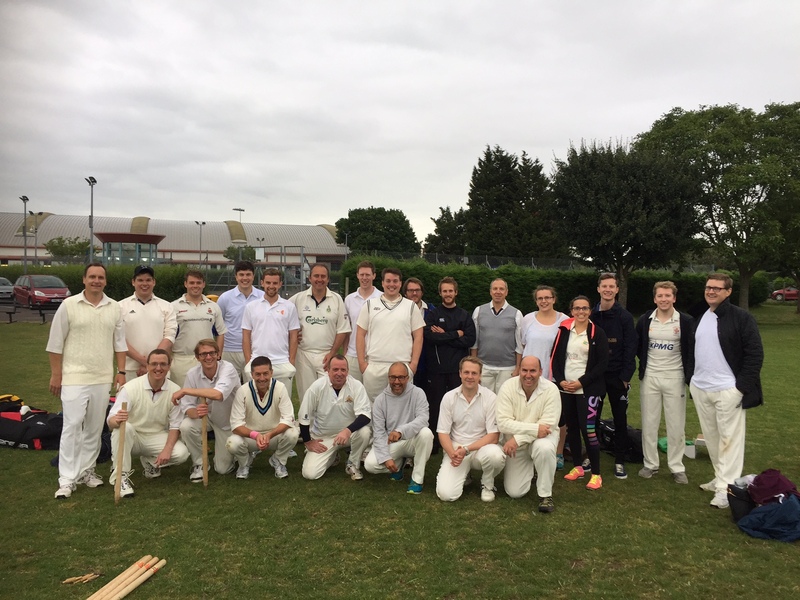 Palminteri joined the Bar for the fixture to even the teams out which proved to be a shrewd move. The Bar struggled to find momentum at the start of their innings with the openers Chris Walker 15 and Bert Welch 10 carefully accumulating an opening partnership of 21 runs. Wickets fell at regular intervals after that, due to some tight bowling and some brilliant catching and fielding. The BLS wicket keeper also had an excellent match and contributed with a stumping off a wide and a runout. The ball was not coming onto the bat and it was rather a sticky wicket and a rather long boundary so a very modest score was posted of 87. This was thanks in no small part to the extras boosting the score. The only other batsman to reach double figures was Ken Duthie 14. BLS had a super opening partnership putting on 46 for the first wicket and the game looked almost over at that point. 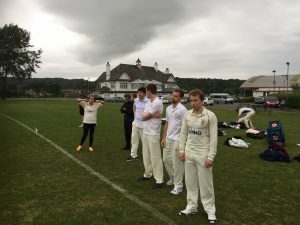 However, the Bar never gave up and despite a few dropped catches the bowlers plugged away and took a few wickets, Welch taking a stunning catch in the covers of Norton. Price was dropped just before reaching his compulsory retirement score of 25 and was the stand out batsman. At 56 for 2 BLS still looked in complete control. However, Vaitilingam took the ball and produced a memorable over. 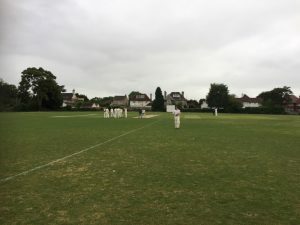 His first ball was pushed for a single and then he took a wicket as the batsman drove the ball to mid-off and Duthie took a remarkable diving one handed catch. The field was bought in for the new batsman who played down the wrong line and was bowled middle stump. Vaitilingam had two in two, could he get a third? The new batsman was surrounded, the ball was floated up nicely, the batsman pushed forward and popped the ball up straight into the air heading towards Duthie who calmly took the catch and Vaitilingam had a hat trick! The BLS had lost 5 wickets for 11 runs, were 57 for 5 in the 10th over and still needed 31 of the last 6 overs. However, there was some further tight bowling, especially by Welch, and Duthie excelled again with another diving catch. Chidgey ran out a batsman with a direct hit, Benson snaffled a simple catch in the covers and it was time for Price to return with only a hand full of runs required. Could he usher BLS home? With bowling options running out, Scutt the wicket keeper was asked to remove his pads and bowl the 14th over with only 2 runs needed. Price smacked the ball into the outfield and ran one and was called for the second, Walker threw the ball to Scutt who was not quite back over the stumps and dived at the wickets but he was short, he then steadied himself and with the batsman still some way short of the crease he knocked the bails off and an unlikely victory was recorded.